Prof A.K.M. Sadrul Islam was born on 7th April 1955 in Jessore. He did PhD in Mechanical Engineering from London University, U.K. in 1988. He served BUET and Islamic University of Technology (a subsidiary organ of OIC) for 36 years as Professor and Head of Department from 1980 to 2016. He was also a Visiting Professor of University Technology Malaysia; a Guest Professor of Institute of Ocean Energy, Saga University, Japan. 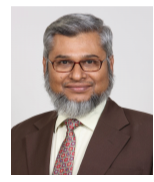 Prof. Islam is also Ex- Chairman, Mechanical Engineering Division, Institution of Engineers Bangladesh (IEB); Secretary General, Bangladesh Society of Mechanical Engineers (BSME). He has been serving IPI in different levels as Director, since 2003; Member, Executive Committee since 2005; Director, Finance since 2010 and formerly Chairman, Audit Committee from 2007 to 2011 and Managing Director (Acting) from 2014 to 2016. About 40 years of versatile experience in the field of administration and management in different organizations like government, semi government and also private sectors. a. Director of IBN SINA Hospital Sylhet Ltd.
b. Director of IBN SINA Consumer Products Ltd.
c. Director, IBN SINA Diagnostic Center, Lalbag Ltd.